You'll no longer have to buy a plane ticket to get in on the cocktails at Seattle's Essex: Owners Brandon Pettit and Molly Wizenberg (a.k.a Orangette) will be sharing their favorite recipes with us, every other week. Drink up, people. Today: A refreshing, three-ingredient drink to get you through the last hot weeks of summer. We stumbled upon this refreshing drink earlier this summer, when we were cooking at home on a night off and were desperate for a cold beer. But the baby was in bed and we didn’t want to go anywhere, and all we had on hand was a couple of long-ignored cans of Bitburger from a camping trip that Brandon took with his dad and uncle two summers ago. It was beer, technically, and it was, in fact, cold. 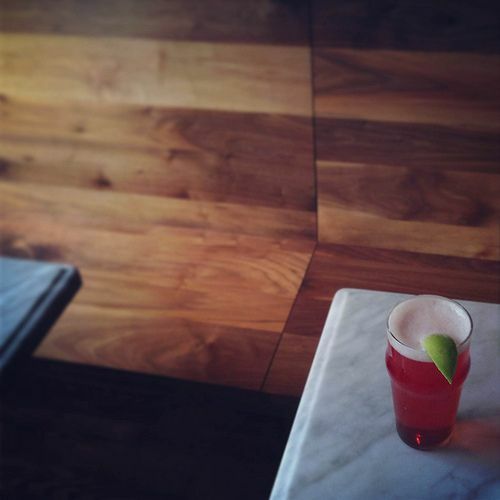 But it wasn’t particularly great, so Brandon decided to try something: he added a healthy splash of Campari, the bright red Italian aperitivo, and dropped in a wedge of lime. And boom, we had our Summer Drink of 2013. It sounds simple, and it is. 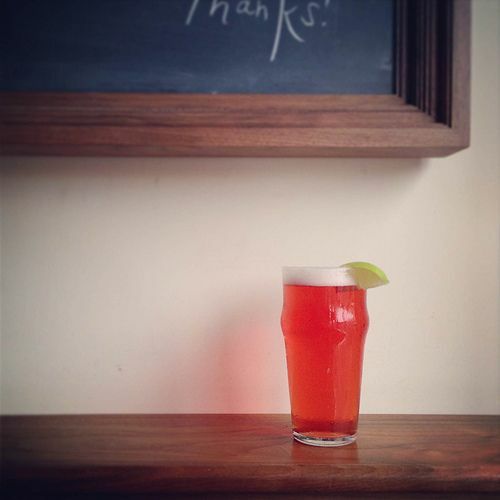 But there’s something surprising that happens when the yeasty, lightly sweet flavor of beer bumps up against bitter orange Campari: the first softens the second, and the second smartens up the first. Together with the brightness of lime, it’s complex and a little sophisticated, but still entirely everyday stuff. At home, we make it with whatever light-colored, not-too-bitter beer we’ve got: the PBR that I bought for making beer-can chicken, or those Coronas from the Fourth of July. But at Essex, where our beer selection is more intentional, we like to make it with a Belgian-style white beer like Blanche de Bruxelles, or Avery White Rascal from Boulder, Colorado. Brandon and Molly met because of a mutual interest in food - or, more specifically, when Brandon read Molly's food blog Orangette and sent her an e-mail that included some very effective compliments. The better part of a decade later, they co-own and run the restaurant Delancey and its sibling Essex, in Seattle. Brandon is the chef of both, and when he's not manning the wood-burning oven, he likes to make things from scratch that more sane people would probably buy, like mustard, vinegars, pretzels, and obscurely flavored liqueurs. Molly is the manager / Organizer of All Things at Delancey and Essex, and she is also the author of the New York Times bestseller A Homemade Life and the forthcoming memoir Delancey. They have a young daughter named June, who is excitedly crawling toward the refrigerator as Molly types this sentence, and two dogs named Jack and Alice. i made this last weekend with ingredients on hand...found a lager in the fridge, swapped bottled lime juice for the fresh, and Aperol for Campari... so a bit lighter in flavor... it made a marvelous addition to our BBQ, Thanks for the inspiration. Sounds similar to a french classic -- Biere Picon, which is a light lager mixed with Amer Picon, the dark, lightly caramelized bitter orange liquor. This would be a bit drier, though, and sounds promising! Drinking these right now, in our basement, where we're trying to stay cool on a hot, humid summer day. These are helping. Now that you are becoming published cocktail experts, you should travel to New Orleans one July and attend Tales of the Cocktail. It lasts several days and hosts experts from around the world with many seminars to enhance your skills! With your food knowledge, this would only build your repertoire as an expert par excellence! Enjoyed one of these last night on the deck. Lovely. This cocktail is called Monaco and it is a French version of Shandy. Last December, when we had “your-best-recipe-with-beer” contest, I was researching beer cocktails and read about many of them and this one including. It’s really very refreshing, beautiful and tasty. Monaco is bit different, made with grenadine syrup. I love Campari with a little vodka, fresh squeezed OJ and seltzer!!! Beer as an aperitif? Maybe that's a stretch. Regardless, so into this. Yay, I have been following MW since reading A Homemade Life. Would LOVE to visit ESSEX in person, but this new column will have to suffice. Kudos to you guys. What funny timing! We are visiting Seattle right now, and went to Essex last night! Also, Delancey: best.pizza.ever. a) Yay! I am so excited for this column, and am planning on stealing all of your ideas and passing them off as my own so that I can appear to be the *best* cocktail party hostess, and b) a Campari shandy is pure brilliance. I am adding this to the top of my list of things to drink once I am no longer incubating a baby. Congrats on the incubation Emily. Daaaang. It's after 6 and I have all of these ingredients which means I am making one of these right now! Man, this looks great. I'm making this to-night! Campari & Blood Orange Soda has been my go-to all summer for the past two summers but sometimes (rarely!) it can get too sweet. This sounds a perfect compromise. Is now too early to make myself one of these? This all makes me so happy. We're doing this in t minus 5 at Food52 HQ. Welcome MollyandBrandon -- can't wait to drink more with you!